Librarians have a long-standing relationship with subject guides. Since the introduction of subject-specific research guides in the 1950s (Vileno, 2007), the work of defining subjects, selecting resources that will be included, and creating the guides has been time-consuming and often unappreciated. The addition of electronic resources, which frequently change, has made creating and reviewing subject guides even more challenging. While Web-based subject guides have significantly improved access, static Web pages limit who can update guides and do not lessen the amount of time spent creating and updating. Considerable effort has been made since the late 1990s to move away from static, labor-intensive HTML pages, and toward searchable, database-driven subject guides. In her March 2007 review of literature on Pathfinders, Luigina Vileno (2007) reports that while the initial implementation of a database-driven solution may consume more time and resources, “the streamlined process greatly enhanced productivity thus cutting down on the cost in the end” (p. 448). Productivity is enhanced primarily by improving the process of updating style and content. For example, a popular electronic resource may appear on many subject pages, meaning that updating links would involve multiple edits. In a database-driven world, where content is pulled from a central location in real time, that same update is made once. Graphical user interfaces allow librarians with little or no knowledge of HTML to add resources, thus encouraging increased staff participation. Opportunities for participation and collaboration can also be made available to students and faculty through the use of Weblogs, Wikis, and social bookmarking software. Though, as Chad F. Boeninger (2006) discovered when he successfully used Web 2.0 tools to present business resources at the Ohio University Libraries, you can lead a horse to water but you can't necessarily make him drink: even when librarians demonstrate subject guides to students, students do not necessarily use them. Librarians must demonstrate the guides’ value to students. In addition to improved workflow and collaboration, database-driven subject guides may give us a way to provide the personalized features and customizable content that users have come to expect. Thanks to work done by libraries to create open-source subject guide applications, the availability of open-source course management systems, and the proliferation of free Web 2.0 tools, the option to create cost-effective, database-driven subject guides is available to all libraries. There are a number of open source subject guides applications available. These Web-based applications, while performing some similar tasks, can vary in functionality and underlying complexity. Most of these applications require a scripting language such as Perl or PHP and a relational database such as MySQL. They also require a Web server such as Apache. Below, some of the more popular applications are discussed. 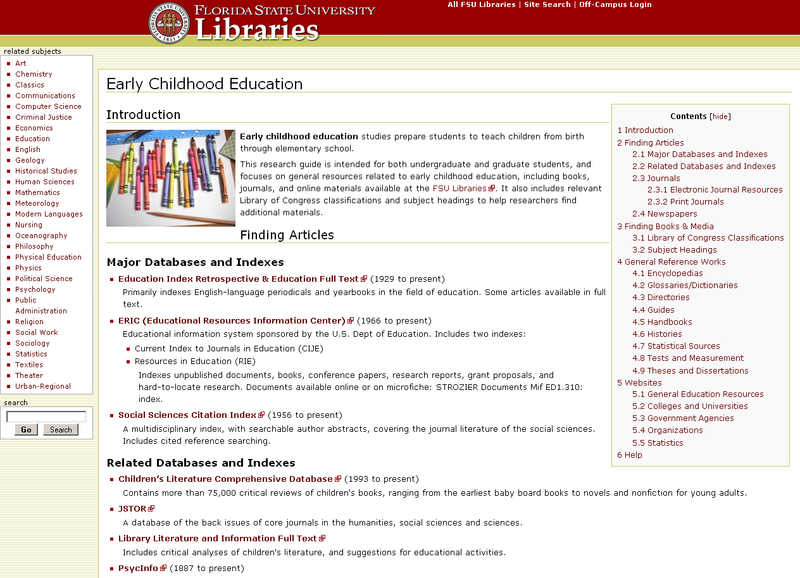 MyLibrary (http://mylibrary.library.nd.edu/) was one of the first tools developed by a library that could maintain Web-based subject guides. Development on the MyLibrary@NCSU portal began as a concept of the Digital Library Initiatives Department (DLI) of the North Carolina State University (NCSU) Libraries. According to Eric Lease Morgan, one of the members of the original project team, the goal was to make it possible for NCSU students, faculty, and staff to “create a personalized profile based on specific academic disciplines.” (Morgan, 2006). MyLibrary@NCSU was named one of the top technology trends in 1999 by the Library and Information Technology Association (LITA) and received wide interest in the library world. Subsequently it was released as open source software in February 2000. MyLibrary, at the time, was more focused on user personalization than on being a pure subject guide tool. However, it was designed in such a way that by selecting subjects, users would have access to materials that were selected by subject specialists for that discipline. The lead developer of MyLibrary, Eric Lease Morgan, brought the application with him to the University of Notre Dame and has since rewritten it. Today, MyLibrary is now much more than simply a subject guide portal. 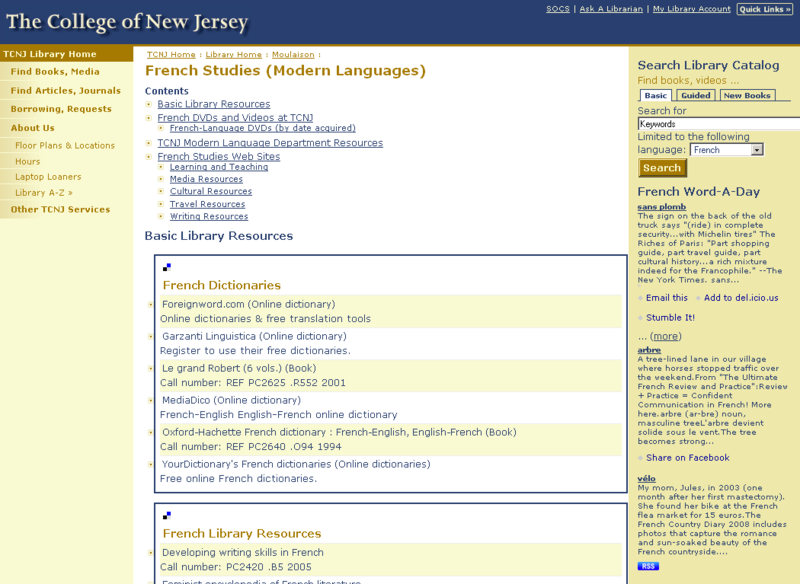 While creating dynamic Web pages, such as subject guides, is still one of the major features of MyLibrary, it is now a full-fledged digital library framework and toolbox. Librarians have various options to import content into the system. 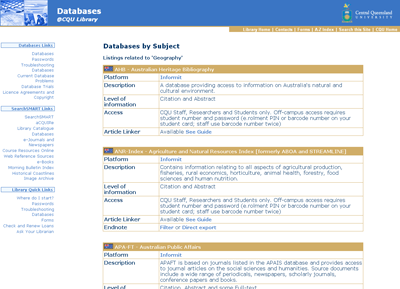 Aside from accepting manual data-entry, MyLibrary can import MARC data and OASI-accessible data. Content from the system can be syndicated into institutional-wide portals and other systems, and users can also personalize pages in “my library” that are akin to MyYahoo, iGoogle, etc. MyLibrary is well documented, as evidenced by a 200+ page, two-volume manual. MyLibrary is written in Perl and requires MySQL. It is licensed under the GNU General Public License (GPL) Version 2. 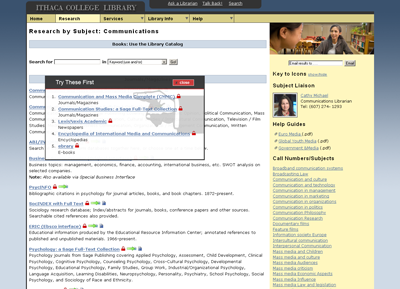 SubjectsPlus (http://www.ithacalibrary.com/subsplus/) is a database-driven subject guide maintained by Andrew Darby of Ithaca College. SubjectsPlus is designed to dynamically manage three aspects of a library Web site. It allows librarians to maintain subject guides, A-Z database lists, and a staff list that is sortable by department and subject specialist. SubjectsPlus makes it possible for librarians to easily add resources of all kinds (even including subject specialists) to subject guides. While not as full-featured as MyLibrary, SubjectsPlus’ simplicity may be welcomed by some institutions. SubjectsPlus is built using PHP and a MySQL backend. 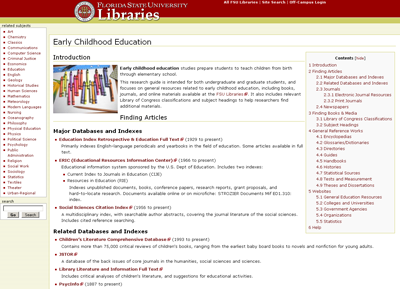 When Darby was first looking for a database-driven subject guide application he discovered a program developed at East Carolina University's Joyner Library known as PirateSource (http://web.lib.ecu.edu/piratesource/). He liked the core program, but wanted to make a number of improvements and updates to the program. He contacted East Carolina University and found out that while they were still using the PirateSource application, it apparently had not been maintained since 2003 and did not have any software license attached to it. East Carolina University granted Darby permission to take the code, improve upon it, and re-license his derivative under the GNU GPL license. Like its successor, PirateSource requires PHP and a MySQL backend. PirateSource is still available for download from East Carolina University but since it is not currently being maintained, we encourage librarians who are interested in PirateSource to look at Darby's recent adaptation. LibData (http://libdata.sourceforge.net/) is a library Web page authoring environment built on top of Open Source tools. It was developed and first put into production at the University of Minnesota for the 2003 fall semester. LibData provides an authoring environment for three different types of Web pages, although a library does not need to use all of them. The three different pages are subject guide pages (Research QuickStart), course related pages (CourseLib) and general purpose Web pages (PageScribe). Like many other Open Source applications, LibData is designed to be very flexible and allows for great local variation. LibData contains approximately forty different database tables and appears to be more complicated architecturally than PirateSource or SubjectsPlus. This means that libraries will most likely require greater local expertise to install and maintain LibData and a successful installation will require more cooperation between librarians and systems staff. The payoff for this complexity is “a rich authoring environment with a great deal of possibilities.” (Bramscher, 2005). Like MyLibrary, one of the strengths of LibData is its documentation. Available documentation includes a 32-page introduction, installation notes, and an E-R (Entity-Relationship) diagram. The most recent version of LibData (2.30) was released in 2005 and includes features such as RSS feeds and robust statistics collecting features. 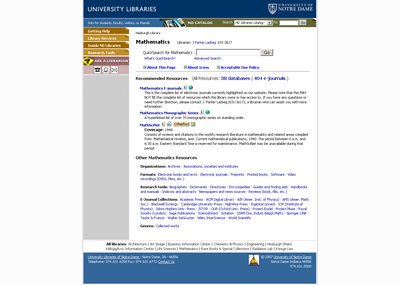 The University of Michigan released its subject guide application, ResearchGuide (http://researchguide.sourceforge.net/), under the MIT Open Source license. ResearchGuide provides a Web environment for librarians to use in order to create subject guides and information pages about themselves. ResearchGuide is somewhat less complicated architecturally than LibData, having fewer than ten database tables. Although the database table structure is not overly complicated, some librarians have expressed concern about being able to implement the authentication method at their institution (Farkas, 2007). Some of the benefits of ResearchGuide, like many of these tools, include a “standard look and feel of guides and centralized management of content” (Libner, FAQ). ResearchGuide requires that PHP and MySQL be installed. The creators of ResearchGuide also recommend that systems administrators have some programming expertise in PHP and MySQL as well as a readiness to provide some instruction to librarians and others using the system. The current downloadable version is 0.5, released January 29, 2002. Although ResearchGuide has not been updated in more than six years, it is being used in at least six universities in three countries (Libner, 2006). Many librarians use blogs for both personal and professional communication. Some, including Chad F. Boeninger, a librarian at Ohio University who is a business subject specialist, have created subject-specific blogs. Boeninger (2006) believed that if he made answers to “popular questions available via the Web, then that might help save the students time in their research endeavors [and] in the process of saving them time, the blog might also help to free up some of [his] time, allowing [him] to focus on more advanced research questions.” While this is a relatively common use of blogs in librarianship, using blogs to create and maintain subject guides is considered less often. One library that is using blogging software for subject guides is Plymouth State University in New Hampshire. 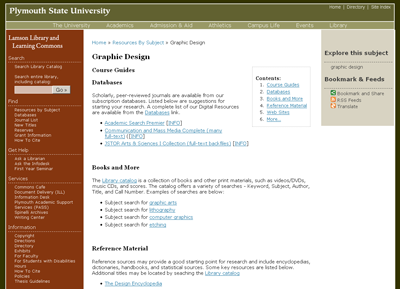 Plymouth State uses Scriblio, which is a customized version of the WordPress blogging software for their subject guides as well as their library OPAC (Bisson, 2007). More information about Scriblio can be found at http://about.scriblio.net/. It is possible to do this with traditional blogging software as well since most blogging software can be easily customized and edited without special knowledge. However, if one wants a custom look and feel to match the rest of the library Web site, someone with knowledge about how to create and maintain blog themes will be required. Themes allow blog maintainers to quickly change the layout and design of their blog. Another library that has started working with blogging software to create subject guides is George Mason University. They are using a combination of the Open Soure WordPress blogging platform and the Open Source Collection Workflow Integration System (CWIS) to create research portals. CWIS is is software that is designed to “assemble, organize, and share collections of data about resources, like Yahoo! or Google Directory but conforming to international and academic standards for metadata” (CWIS Overview 2008). George Mason's Bioinformatics research portal (http://phobos.gmu.edu/melange/) is quite impressive, but as Wally Grotophorst (2008) points out “a librarian serving as curator for one of these research portals will be doing quite a bit of work–identifying new resources, writing blog entries, chatting with clients, performing maintenance on links and more.” Therefore, this approach should be considered in environments where research portal maintainers believe that such an effort is justified. Popular wiki platforms (for example, MediaWiki, SeedWiki, TWiki, and PBwiki, among others) have been used by many libraries to create internal resources, and are quickly spreading to the public side of library services. Meredith Farkas, in her May 2007 American Libraries article, points out that wikis can resolve three major problems of static Subject Guides by “making a subject guide easier to update, searchable, and collaborative” (Farkas 2007, p. 33). MediaWiki, best known as the software that runs Wikipedia, has been used to create Subject Guides at Florida State University Libraries, Brock University's Gibson Library, and by the Ohio University Library's Chad Boeninger. MediaWiki's major advantage is its association with Wikipedia, which ensures a strong user base, frequent software updates, a degree of longevity, and a familiar look and navigation system for users. Florida State University Libraries also liked that MediaWiki is based on MySQL, which they felt would ease transfer of content between programs. In addition to MySQL, PHP and a Web server are required to install MediaWiki, which, according to Tim Ribaric, “can be installed in under an hour” (2007, p. 26). Of all the database-driven options discussed here, because of their ease of use, familiarity, and collaborative nature, Wikis are perhaps the best option for collaboration among library staff, faculty, and students, though libraries have utilized that collaborative component to varying degrees. Beyond the options previously discussed here, another option for some libraries may be to utilize their campus Course Management System. The Supported Learning Centre at City Lit, the largest adult education college in Europe, has created subject guides using the City Lit's installation of Moodle. Moodle is an open source course management system that “can scale from a single-teacher site to a University with 200,000 students” (Moodle, 2008). City Lit's subject guides can be viewed by anyone from http://moodle.citylit.ac.uk/moodle/mod/resource/view.php?id=123. Librarians at the Pennsylvania State University have created generic subject guides within their ANGEL course management system that provide links to electronic books and library databases (Lovett, 2004) and guides are automatically available to students through the course management system. 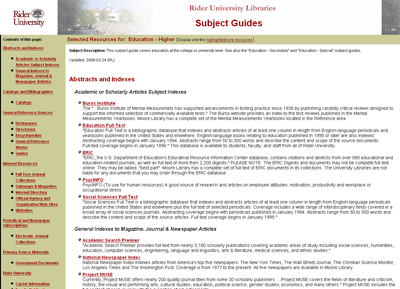 In order to allow librarians to create and edit these guides, a customized and flexible template was created that includes default information and resources that the library can use or modify (Snavely and Smith, 2003). While ANGEL is proprietary software, there is no reason to believe that similar projects could not be implemented using either Moodle or Sakai, another Open Source course management system. In fact, the Sakai's Sakaibrary project (http://www.dlib.indiana.edu/projects/sakai/) is currently developing a working prototype of a subject research guide component. The Sakaibrary project's goal is to free library resources from silos within the library and make them available within the Sakai course management system. The subject research guides will aim to meet the needs of three relatively distinct user groups: librarians, instructors, and students. The goal of the research portion of the project “is to design an application to easily produce (and later customize) research guides” (Dueber, 2007). 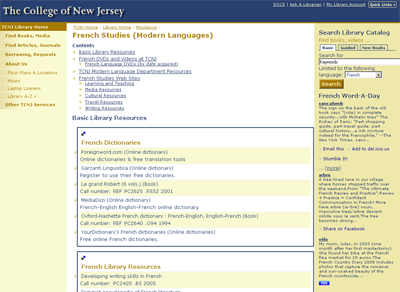 Librarians have approached the creation of Web-based subject guides in various ways. They have used static HTML, database-driven subject guides, course management systems, and Web 2.0 technologies such as blogs and social bookmarking Web sites. Each of these approaches have merit and individual libraries may find some approaches better suited to them than others. Librarians who are going to be creating and maintaining these subject guides will need to work closely with systems staff that are responsible for installing and maintaining the software to see which package is the right fit for their organization. The decision about which software package to implement should be made after evaluating local infrastructure, technical expertise, the goals of the project, and the functionality desired. While it is true that this is not a one-size fits all solution, there are a few things that seem true when reviewing the literature and while investigating the various options out there. It is important that whichever solution is chosen, that subject guides are maintained and updated on a regular basis. This can include the use of link checkers and other automated methods. However nothing is better than having a person (either a librarian or even a student worker) check the pages manually. If not, they will become stale. Database-driven and social software-based subject guides offer non-tech savvy librarians an easy way to edit and keep the subject guides that they are responsible for current. Database-driven guides, because of their nature and design offer additional benefits as well. Their design typically enforces a standard look-and-feel for the guides. Likewise, a resource can be updated in one place and that change will appear throughout the system. This makes maintenance of these guides less time-consuming and more accurate than a traditional static HTML Web page. While all of the guides reviewed offer benefits, when investigating these guides we were impressed with the ongoing development of SubjectsPlus and its rather straightforward and easy to maintain design (for someone with some technical expertise). However, if a library has a need for a more full-featured solution, they may want to look into a system like MyLibrary that is more than a subject guide portal and offers a full-fledged digital library framework. This is not to say the other solutions reviewed don't have technical merits, but the lack of recent updates may cause some concern for libraries without programmers on staff. Social software based solutions, such as blogs, wikis, and social bookmarking sites may also be a good solution for smaller libraries that have limited number of staff creating and maintaining guides. They are relatively easy to use and with many free or inexpensive hosting options available, it is not necessary to have a systems administrator on staff. However, these approaches may not offer the uniformity and the “edit-a-resource-once, update everywhere” functionality that solutions like MyLibrary, SubjectsPlus, LibData and ResearchGuide offer. Bisson, Casey (2007, Sep 6). Launch! MaisonBisson blog. Retrieved February 9, 2008 from <http://maisonbisson.com/blog/post/11923/lamson-library-website-based-on-scriblio-launched>. Bramscher, Paul F. (2005, November 18). LibData introduction & functional description. Retrieved December 14, 2007 from <http://libdata.sourceforge.net/docs/LibData_Intro.rtf>. CWIS Overview (2008). Retrieved March 19, 2008 from <http://scout.wisc.edu/Projects/CWIS/>. Darby, Andrew (2006). Implementing an open source application in a college library: ECU’s pirate source. College & Undergraduate Libraries, 13(1), 41-52. Dueber, Bill (2007, Feb 22). Research Guides and Sakaibrary. Retrieved Janaury 27, 2008 from <http://confluence.sakaiproject.org/confluence/display/SLIB/Research+Guides+and+Sakaibrary>. Farkas, Meredith (2007). Subject guide 2.0. American Libraries, 38(5), 33-33. Gibbons, Susan. (2005). Library course pages. Library Technology Reports, 41(3), 33-43. Gibbons, Susan (2003, March). Building upon the MyLibrary concept to better meet the information needs of college students. DLib Magazine, 9 (3). Retrieved from <http://www.dlib.org/dlib/march03/gibbons/03gibbons.html>. Herzog, Brian (2007, July 28). 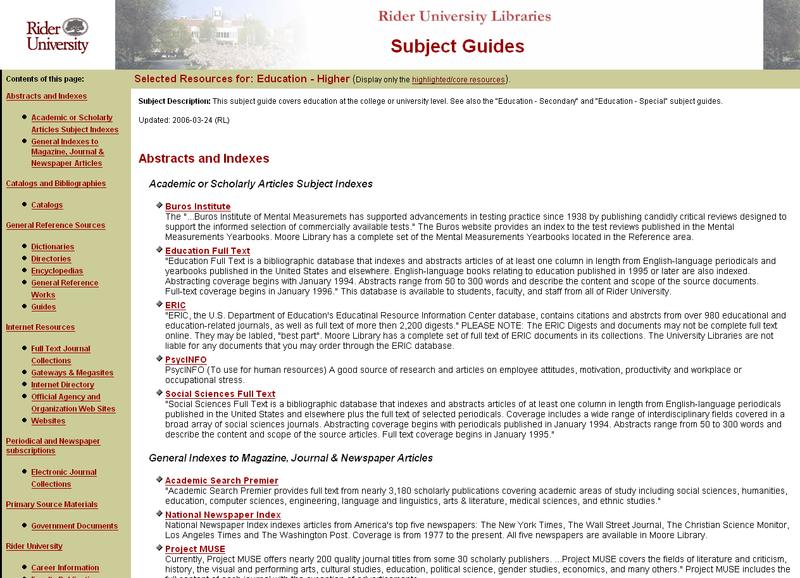 Library subject guides using del.icio.us. herzogbr.net Blog: A Hitchhiker’s Guide to Fear and Loathing at a Public Library Reference Desk. Retrieved December 9, 2007 from <http://www.herzogbr.net/blog/?p=164>. Introducing JSON (2007). Retrieved August 24, 2007 from <http://json.org>. Libner, Kelsey. Frequently Asked Questions. Retrieved December 12, 2007 from <http://researchguide.sourceforge.net/faq.html>. Libner, Kelsey (2006, February 12). Update on ResearchGuide implementations. Retrieved December 12, 2007 from <http://sourceforge.net/forum/forum.php?forum_id=539358>. Moodle: A free, Open Source course management system for online learning (2008). Retrieved January 27, 2008 from <http://moodle.org/>. Morgan, Keith (2006). Pioneering Portals: A History Of MyLibrary@NCState. In Eric Lease Morgan, et al., Designing, Implementing, and Maintaining Digital Library Services and Collections with MyLibrary. Retrieved December 9, 2007 from <http://mylibrary.library.nd.edu/documentation/ch/ch28.html>. Snavely, Loanne & Smith, Helen (2003). Bringing the library to students: linking customized library resources through a course-management system. Paper presented at the Association of College and Research Libraries 11th National Conference, April 10-13, 2003. Retrieved January 27, 2008 from <http://www.ala.org/ala/acrl/acrlevents/snavelysmith.PDF>. Edward M. Corrado is Systems Librarian at The College of New Jersey (TCNJ) located in Ewing, NJ, USA. Corrado earned his Masters of Library Service from Rutgers University and has been working with library technology for over ten years. His scholarly interests include the use of social networking, emerging technologies, and Open Source Software in libraries. He is also on the editorial committee of the Code4Lib Journal. If you would like to contact him, his Web site is http://ecorrado.us/. Kathryn A. Frederick is the Access and Electronic Services Librarian at Elmira College (Elmira, NY). Ms. Frederick views libraries as vital social institutions and ponders their changing role in society. She is interested in expanding the scope and quality of library services by, among other things, integrating Web 2.0 and Open Source tools. Ms. Frederick is active in the New York Library Association (NYLA), currently serving as President of the NYLA SMART section. Visit www.kathrynafrederick.org for more information. 13 Responses to "Free and Open Source Options for Creating Database-Driven Subject Guides"
Thanks for your article! Very helpful & informative. I especially liked your analysis about which solution to consider based on an institution’s staffing (and other) resources. Kudos! This is a very interesting article and very timley for me personally. In your opinion where do tools such as the following list fall? I think digital library/repository software like the programs you mention can play an interesting role with subject guides. However, I’m not really familiar with anyone using them as a subject guide. I have seen some sites that appear to use digital library software for electronic reserves though. I think the main issue with using one of these programs as a subject guide tool is copyright. They are typically designed to store information instead of linking to it. As we have seen by the recent lawsuit at Georgia State University, this method would probably not be appreciated by publishers (and besides, this approach would not be able to deal well with constantly updating information). All that said, maybe with some code modifications someone could make one of these tools into a pretty good subject guide tool. Have you guys explore Gregarius (http://gregarius.net). I can’t get hold of Feed Library by BlogDrive. So, I used Gregarius as an alternative Feeds Directory to provide users the listing of my database feeds. Thanks, a very interesting article. Similar in many respects to the blog post I have written. You have covered a huge range of resources available to Librarians and this could come in very handy for an assignment I am soon to complete for University. Look forward to sharing valuable resources with you. This will surely work for any library in work, To be organize that much so no one will be lost and take their time when searching for a certain book.